Carl has been involved in the business since he was a youngster, helping his parents around the shop in any way he could. In 2000, Carl took over for his parents and has helped establish 2 of the best golf shops in the world. Carl is heavily invested in all aspects of the business - from purchasing and vendor relations to merchandising and business decisions. You can often find Carl on our sales floor greeting or assisting customers. Being a business owner and proud father, Carl doesn't get out to play as much as he'd like - when he does, he makes the most of it! Pete started working at Carl's 40 years ago on the range retrieving buckets and performing routine maintenance. Pete now oversees both stores, making sure every aspect of the business is operational. Pete serves a key role in the buying and merchandising process and maintains positive working relationships with all of our vendors. His passion for the game of golf has kept him motivated throughout his career. Pete sneaks out to play any chance he gets always welcomes new members to "the group". Pete is a family man and enjoys the company of his dog Miko. With 35+ years of retail experience Neal has been an integral part of the Carl's Golfland daily operations since 1995. Neal manages Golfland's advertising and marketing along with the information technology for both stores. As the man behind the Carl's Golfland Annual, he works hard to deliver vivid content to readers across Michigan, and more recently the world with our online version. He is heavily involved in the community and can often be found at charitable/fundraiser events. Despite abuse from his colleagues, Neal is still a lifelong Notre Dame fan. Go Irish! Casey has been heavily involved in the golf industry since he was 12 years old. Casey joined the Carl's team in 2011 to oversee the Launch Pad's development and has since assumed many roles. 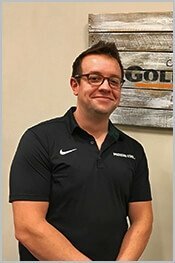 From buying and merchandising decisions to HR and staff development, Casey wears many hats for Golfland and works diligently to develop Golfland.. He is an avid golfer and known across the state of Michigan for his strong amateur play. Casey has 2 state stroke play championships under his belt. Aside from work and golf, Casey is a dedicated family man and enjoys the company of his wife and 3 girls. Favorite Golf Course: Pine Valley G.C. Derek started with Carl's back in 1991 when he was just 16. Like many other long tenured Carl's employees, Derek knows the in's and out's of Carl's Golfland from every vantage point. 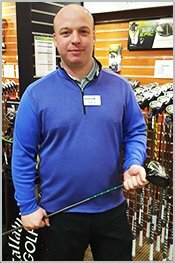 Derek is now Vice President-Merchandising responsible for many buying aspects including clubs, footwear, balls, bags, gloves, and accessories. Derek thoroughly enjoys college hoops and Tigers baseball. Derek is a former Evans Scholar and Michigan State grad, but an avid U of M sports fan. Scott has been with Carl's Golfland since he was 14 yrs. old (1998). He has worked his way up the ranks learning virtually every aspect of the business. Scott is now responsible for all E-commerce platforms and works closely with the Carl's buyers and his team to make sure everything is up and running smoothly. Scott is a proud father of 2 boys. Time permitting, Scott still loves to get out and play a quick 18 with the guys. Interesting golf fact - Scott is a lefty golfer but putts right-handed! Scott has his BA in Marketing and Masters in Business Administration. 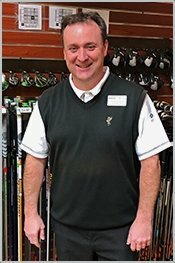 Adam has worked in the golf industry since 2000 and has been with Carl’s Golfland since 2011. Adam is an avid fisherman; he fishes on Lake St. Clair in both the winter time and summer time. He grew up on the East Side where he attended Sterling Heights Stevenson and played on the defensive line. He now resides in Rochester where he lives with his girlfriend and his two dogs, Hogan and Penny. Tim started at Carl’s Golfland in the summer of 2010 as a cashier and soon after he became Golfland’s second E-Commerce employee ever! He grew up in Shelby Township, MI where he grew a passion for all sports, but especially golf. Tim graduated from Michigan State University in 2010 with a degree in Advertising. Tim lives with his wife and dog, Sophie who is a 7 ½ year old shih-tzu. Fun Fact: Tim used to be a competitive video gamer! Jack is an 18 year veteran of Carl's Golfland at St. John's. 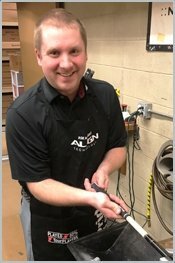 He is one of our Equipment Specialists and takes great pride in fitting people with equipment that improves their game. Jack spends most of his off time exploring the great outdoors with his wife and two sons. Jack is a graduate of Michigan State University and loves spending a cool fall day cheering on MSU football and basketball. Go Green, Go White! Mike's grandfather introduced him to the game of golf at age 7. Mike loves playing golf with something on the line. "It helps me focus and keeps pushing me to get better." Mike is a DIE Hard Detroit Red Wings fan and loves spending time with his loving girlfriend, family, and friends. Fun fact, Mike can also play golf left handed. His low round left handed is 39 for nine holes.